Debit vs. Credit - Which One is Better for Saving Money in 2018? Debit vs. Credit: Which One is Better for Saving Money? If you’re struggling to save money, you’re not alone. According to a National Foundation for Credit Counseling study, 32% of Americans don’t have any short-term savings. Before figuring out ways to save extra cash, you might want to first think about how you currently spend and pay for things. That’s right. Take a look at how debit and credit cards stack up against each other when it comes to saving money. This is an in-depth breakdown of debit vs. credit cards. As you can imagine, how much you save depends largely on how much you spend. The main difference between debit and credit cards is how much spending power you have. With a debit card, for example, you can usually only spend what you have in the account. In some cases, though, you can spend more with overdraft protection. But, this isn’t recommended because banks charge an average overdraft fee of $33.07. To avoid this situation altogether, you can opt out of overdraft protection with your bank. With credit cards, you can spend up to your credit limit, whether or not you have the money in your bank account to pay it off immediately. If you have a very low spending limit, you might not have issues paying off your balance in full. The higher the credit limit, though, the more tempted you’ll be to overspend. If you’re not saving enough on your own, one source of extra cash may be cash-back rewards you get from using your debit or credit card. The one problem with this is that not many banks offer debit card rewards programs. Most cash-back rewards programs are with credit cards. Some credit cards offer up to 2.5% cash back. So, if you spend $2,000 every month on your credit card, that’s $50 you can withdraw and put in your savings account — or $600 per year. A debit card is tied directly to your checking account. This means that if you have a savings account with the same bank, you can easily set up automatic transfers from your checking to your savings accounts. Some bank accounts even help you save money by using your debit card. 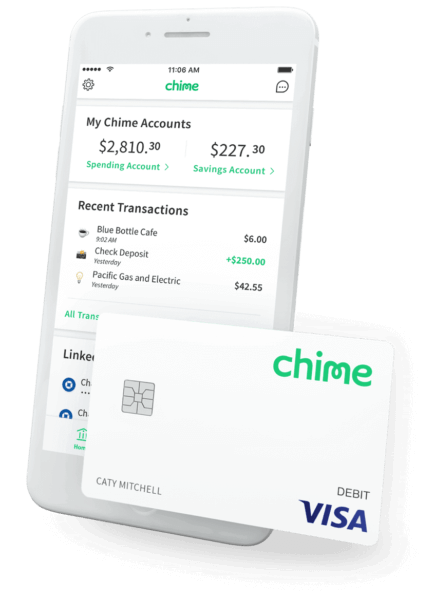 For example, Chime will round up each transaction made with the Chime Visa® Debit Card to the nearest dollar and automatically transfer the roundup amount from your Chime Spending account to your Chime Savings account. If you use your Chime Visa® Debit Card an average of twice a day, you could have almost $400 extra in savings after a year! One of the biggest threats to your mission to save money might be your need to pay off debt. When you pay back debt, your monthly payment is going to your creditor instead of your savings account. What’s more, interest payments eat up even more of the money that you could be socking away into your savings – if only you didn’t have the debt to pay back. Luckily, debt isn’t something you have to worry about with debit cards unless you’re consistently overdrafting on your checking account. With a credit card, however, you could get into debt if you’re not paying your balance in full each month. The longer this happens, the more debt builds up. And, since credit cards charge an average interest rate of 16.14%, that interest will add up fast. All things considered, debit cards do a better job of helping you save than credit cards. But that doesn’t mean they’re the best option for everyone. Your spending and saving habits are the most important factor in this debate. For example, if you’re a big spender without a budget, you’d be better off with a debit card, which will restrict you to spending only what you have and keep you out of debt. Chime’s Automatic Savings Program is also a must-have if you struggle to save on your own. However, if you already have good money habits, a credit card might be a good way to go. Remember that the rewards from a cash-back credit card can supplement the savings you already have. Is a debit card right for you? To find out which option, credit vs. debit, is best for you, take a step back and think about your financial habits. Be honest with yourself and consider how each payment method fits your savings goals. The good news: you’re not stuck with your decision. So, if you try it for a while and it’s not working out, you can always switch.